Wirelessly enable your Bang and Olufsen music system! 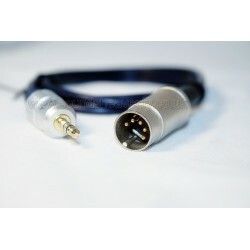 Use this cable to connect your B&O system to an Aiport Express and stream your music wirelessly with Airplay from your iPhone or Apple device. Wirelessly enable your B&O music system - stream directly from your iPhone! This high quality cable will allow you to connect a Bang and Olufsen music system directly to your Aiport Express. This will let you stream iTunes music and other audio from your iPhone, iPad or Mac wirelessly to your Bang and Olufsen system into the "Tape" or "Aux In" socket. You can wirelessly enable your entire Bang and Olufsen network using an Airport Express and this cable. Stream your iTunes music wirelessly with Airplay to your Beomaster, Beovision and Beolabs!